So today, I decided to try out the new Krups Waffle Maker that I received for my birthday. I was quite bothered about the ingredients, because any basic waffle recipe would require eggs to make and we (Hindus) are observing a Navratri fast at the moment. I didn't want to wait until the fast would be over to make (and definitely eat!!) 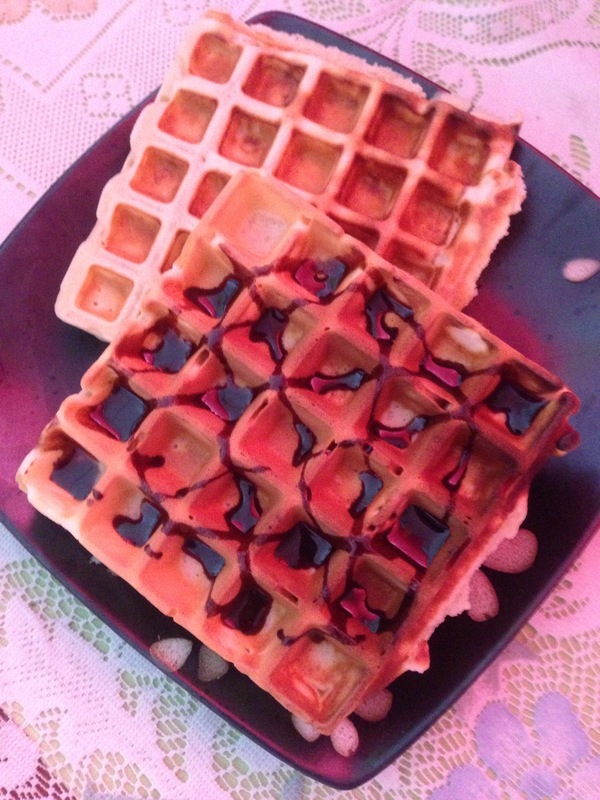 homemade waffles. However determined I was, and to satisfy my hunger for waffles, I thought why not try a basic eggless waffle recipe, with easily available ingredients. The waffles turned out good enough for a first time! 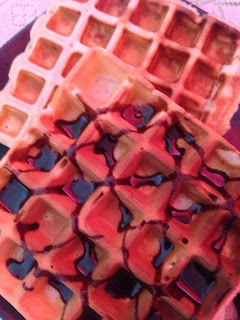 I was a tinnie tiny bit disappointed with the topping that I used - the Illovo Smooth Chocolate sauce, which didn't do any justice to the waffle. I completely forgot that I had Nutella spread at home until my sister complained about the topping being a bit 'sour'. Nonetheless, the waffles were fluffy and soft. They could almost melt in the mouth! You can make them for breakfast or tea time and they are ready in a jiffy! What more to ask for on a busy morning? 1. Pre-heat your waffle maker, see the instructions according to your manufacturer, mine was set on thermostat 6. 2. Combine the dry ingredients together (flour, sugar, salt and baking powder). 3. Add the vanilla essence and the oil. Mix well. 4. Add the milk gradually. Using a a whisk, mix the batter but make sure you do not over mix the batter. (when the flour mixture folds in, you can use a spatula to continue the mixing to avoid over beating the batter which will make the crumb tougher). In this recipe I am using vegetable oil but you could use butter as well. I don't have brush the plates of the waffle maker with butter/oil, however your appliance might be different from mine, so please read the instructions about the pre-heating options and how long you should let it cook.